First Impressions of Bruce Springsteen’s “Wrecking Ball” – Track #11 – “We Are Alive” - Stream the final, inspirational track on "The Top 22" website! Bruce Springsteen performing on "Late Night with Jimmy Fallon"
Here we are, at the end of our grand, exciting journey through Bruce Springsteen’s latest masterpiece, Wrecking Ball. To hype the March 6th release of this new album, Springsteen has been releasing each of the record’s eleven tracks online, one per day, streaming for free at various music websites. I’ve been there from the beginning, giving my in-depth analysis of each and every song, and at the end of this article, you’ll find links to all of the reviews. I sincerely hope you’ve enjoyed reading these pieces as much as I have writing them. Wrecking Ball is an album that stirred my mind and soul in equal measure, and from the very beginning, I’ve felt compelled to share my personal experience with what I consider to be one of Bruce’s finest records, hyperbole I don’t give out lightly. Today, we finish off Wrecking Ball with track #11, “We Are Alive,” streaming for free all day at “The Top 22” website. You can always expect a lot out of a Springsteen finale, but even then, Bruce may have outdone himself with this one. Read my extensive analysis of “We Are Alive” after the jump…. “We Are Alive,” the last track on Wrecking Ball, opens with the distinctive sound of a record needle running through layers of dust on a vinyl. To any music fan who has ever owned a turntable, it’s the most exciting sound in the world. Once the needle drops, that distinctive, warm, rich analogue sound comes in, and we know we’re just seconds away from embarking on another grand musical adventure. The message isn’t hard to understand. Springsteen is starting over: this may be the last track of Wrecking Ball, but it’s the first step in whatever comes next. And perhaps surprisingly – though not if you’ve paid close attention to the record’s subtext – Springsteen is damn optimistic about the future. Even without the turntable sounds, the album’s structure makes it clear that “We Are Alive” is both prologue and epilogue. The characters Springsteen sang about throughout Wrecking Ball – the thieving couple of “Easy Money,” the mourning wanderer of “This Depression,” the “Jack of All Trades,” and, of course, the spirit of Giants Stadium – all gathered together in “Rocky Ground” in a show of solidarity before boarding a train and departing this world hand-in-hand in “Land of Hope and Dreams.” Their journey has come to a close, but in “We Are Alive,” Springsteen returns us to Earth, where a new set of lost souls are looking for guidance of their own. There you go. That’s Wrecking Ball in a nutshell. I’ve been saying all along that the album is about the indestructibility of the human spirit, and “We Are Alive” proves my point. Because Springsteen’s characters maintained hope in the face of incredible hardship, their souls continue to live and to thrive, to relate the lessons they learned and assure the next generation that so long as one faces life with courage and faith, one will always be able to move forward, eternally undefeated. In a broader context, this is the value Springsteen places in humanity itself. He’s spent his career tracing hardship – the perils of chasing one’s dreams on Born to Run, the difficulty in holding on to what matters most in Darkness on the Edge of Town, the stark isolation from our own cultures and relationships chronicled in Nebraska and Tunnel of Love. But thirty years after writing these masterpieces, society hasn’t succumbed. The characters of those albums have existed time and time again, and though their hardships may not have lessened, the fact that they’re still out there – hoping, dreaming, and trying – speaks to an ethereal strength at the heart of humanity. In the uniquely American context Springsteen’s always operated in, it expresses the greatness of this country. We still endure. We still try to push forward. No one’s given up yet, and because of that, Springsteen now sees strength where he once found pain. I say none of this to disparage his classic work. Much as I love Wrecking Ball, I still wouldn’t place it quite on par with many of his early masterpieces. But Wrecking Ball is a revelation because, from start to finish, thematically, musically, and lyrically, this is Bruce Springsteen as we’ve never heard him before, and when one views it in the context of his entire body of work, its power grows exponentially. The journey recounted in Wrecking Ball didn’t start with “We Take Care of Our Own.” It started with the crazy, rhyme-obsessed kid who was blinded by the light, who tapped into every emotion imaginable in his journey through the American heartland before coming to the conclusion he defends on this latest album: the soul is strong. See? Springsteen is clearly stating that this story has happened over and over again throughout history, and rather than viewing that as a sad cycle of defeat, he chooses to see it as a hopeful ray of light. After all, how could the “cycle” exist in the first place if we didn’t have the strength to carry on? It’s an inspiring message, one absolutely worth celebrating, and the music reflects that. “We Are Alive” is one hell of a fun listen; it’s the “Seeger Sessions” sound at its best mixed with a healthy dose of Latin flavor, all produced and performed so perfectly that it begs the question: Why did it take so long for Bruce Springsteen to use a Mariachi band? He even throws in the horn riff from Johnny Cash’s “Ring of Fire,” just to make this closing as infectiously engaging as possible. Where the handclaps come in near the end, I’m not ashamed to admit that I’ve joined in more than once. Finally, “We Are Alive,” along with the rest of Wrecking Ball, operates on one other level I haven’t mentioned so far. The shadow of Clarence Clemons looms long over this album, as it will over everything Springsteen does from now on. Bruce’s last two albums, Magic and Working on a Dream, both ended with tributes to fallen friends – Springsteen’s personal assistant Terry Magovern and E-Street organist Danny Federici – but Wrecking Ball contains no Clarence-centered remembrance. Springsteen has instead given him what I find to be an even more meaningful send-off: he’s built Clarence’s ‘tribute’ into the very fabric of the album. Is it a stretch to imagine Springsteen writing “This Depression” after losing his best friend? Couldn’t the demolished stadium of “Wrecking Ball” be a stand-in for the Big Man, gone but never forgotten? If you take away the sexual undertones, doesn’t “You’ve Got It” boil down to a heartfelt expression of the best qualities one human being finds in another? As I wrote yesterday, Clarence is positioned as the conductor of the train on “Land of Hope and Dreams,” returning briefly from the great beyond to guide his friends on the next phase of their journey. Can’t you boil down all of Wrecking Ball to that same basic concept? --Thanks to www.SpringsteenLyrics.com for providing perfect transcriptions of each song, along with extensive production and personnel information I made good use of in each article. 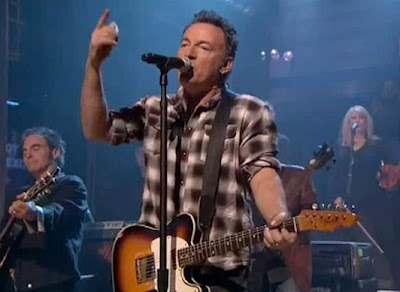 --Thanks to www.Backstreets.com for their all-encompassing coverage of the daily song streams, and for all the other invaluable news and resources that makes it both fun and easy to be a Springsteen fanatic. --And a big, warm, extra-special thanks to any and all readers who followed me into the heart of Wrecking Ball. I’ve done lots and lots of writing in my life, but little of it meant quite as much as all this did.